Last weekend marked my eighth ride for Cycle for Survival. I have been a commited supporter, ever since the founder, Jennifer Goodman Linn encouraged me to get involved many years ago. We met in my office at the company where she was newly employed, and making the rounds of meet and greets company executives. During her rotation with me, as we were getting to know one another, she mentioned her passion for cycling, that her hair was a wig, and that every Friday afternoon, she went for her weekly “spa treatments,” as she referred to her chemo regimen. I’m not sure of much else, but I think she had me at wig. I was impressed at how open and honest about her illness she was, and how she never let it hold her back. Jen was an inspiration to all that came in contact with her. During her long battle with a rare form of sarcoma, she never wavered in her enthusiasm for life, and helping others like herself find a cure for this deadly disease. 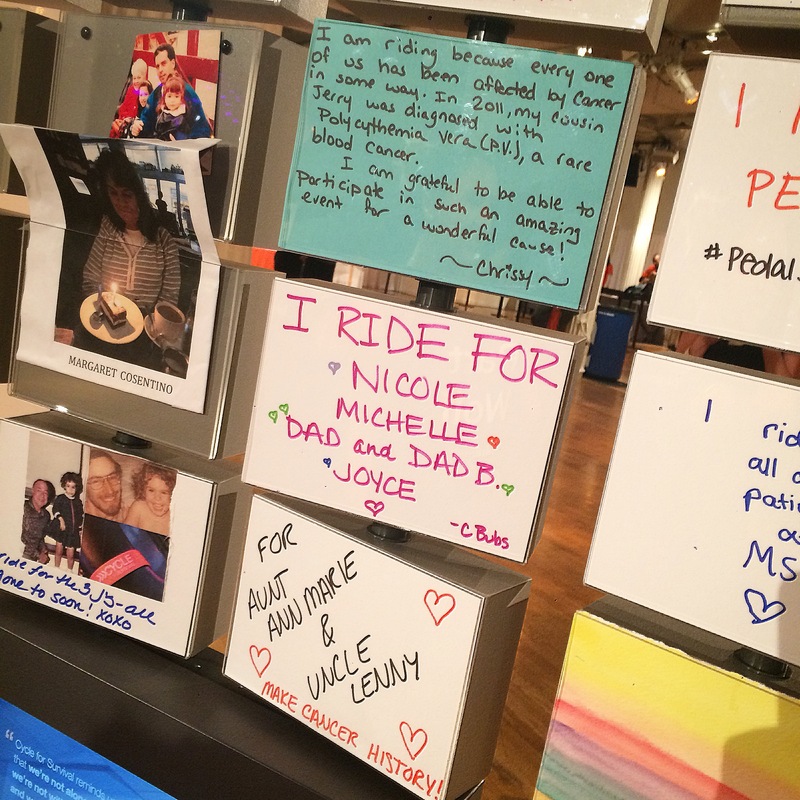 Through that love of cycling, and immense gratitude to her doctors and staff at Memorial Sloane Kettering Cancer Center, she started a charity ride at Equinox, to raise money for her cause. Who ever would have imagined that years later, that spin class would turn into more than 31,000 people riding at Equinox locations all across the country and raising more than $132,000,000 to date? I vowed to ride until I could no longer move my legs, or we found a cure and didn’t need to. I was committed, and passionate about the cause and that passion was contagious. This year however, something changed. It became increasingly more difficult to fill my team roster. My team of 16 dwindled to 4. Solicating donations was tougher than prior years. As a result of all this, even the event itself left me feeling a little disconnected. The current political climate certainly affected things, and people are spread very thin right now when it comes to rallying for causes and shelling out money for support. I get that. But I think some of the longtime participants may have a little “event fatigue.” It occurred to me, after I got home and thought about it, that it was no longer about Jen. Even after she passed away, she was still a presence at the events. From sharing her 40th birthday dance video, to her parents running around in satin robes with boxing gloves, fighting cancer in their own way, to Sloane Kettering naming a research lab in her honor, Jen was always still there in spirit. But this year, she wasn’t. Don’t get me wrong, I am thrilled to see how big this event has become, and the goal was always to raise as much money as possible. But I missed the human factor that made it so special. I started to question if it was time to let the next wave take over. That is, until an email came into my inbox. It was from a women named Heather Von St. James, and she was celebrating her 11th year of survival from a deadly form of cancer called mesothelioma that she discovered just 3 months after giving birth to her daughter. Today, I finally had enough time to explore her blog and read her story, and it is an uplifting one. Given just 15 months to live, Heather traveled to Boston to undergo what was then, a groundbreaking surgical proceedure, followed by subsequent rounds of chemo and radiation therapy that would hopefully increase her chances of living another 10 years. Defying all odds, she is still healthy 11 years later, and is using her experience to spread awareness and help others fighting this disease. She approached me to use this space to help her bring awareness to mesothelioma, and it’s treatment. Her blog tells her story in a way that I never could, outlining her struggles, her fear and her triumphant road to recovery. While I was reading, wiping away tears, it hit me. This is why we ride. Not for Jen, but for the many, many Jens out there, who fight the battle against cancer every day and win. For the Heathers, the family, friends and co-workers who get diagnosed every day and need the support and treatment that isn’t always readily available to them. We ride to find a cure, or at the very least a protocol that can extend one’s life. It’s not about any one person. It is about coming together to fight a demon that affects us all. Unlike our political state right now, cancer does not discriminate. It doesn’t care about race, religion, gender, or sexual orientation. It doesn’t care if you are a Democrat, or a Republican. And it needs to be stopped. When you or a loved one is diagnosed with cancer, there are no alternative facts. It is a life or death issue that we need rally around. If you would like to donate to Cycle for Survival or Heather Von St. James’ Lung Leavin’ Day Fundraiser please click on the links. 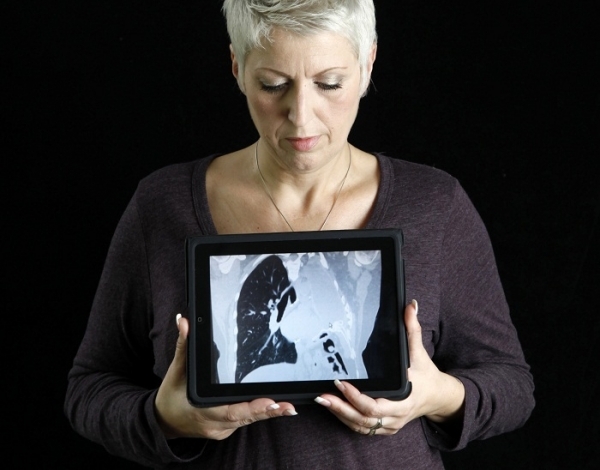 If you’d like to learn more about mesothelioma and the dangers of asbestos exposure read here. This entry was posted on March 6, 2017 at 7:23 am and is filed under Uncategorized. You can follow any responses to this entry through the RSS 2.0 feed. You can leave a response, or trackback from your own site.